The integrated objective of this DOC-team project Thinking Space – An interdisciplinary approach to the spatial dimension of Ambient Intelligence: Symmetries and asymmetries in the interaction between humans and objects funded by the Austrian Academy of Sciences is to approach the spatial dimension of Ambient Intelligence (AmI) as the embedding of human daily life in a smart landscape. In this new context of persuasive technologies a new understanding of space will be developed by assessing the symmetry of interactions of humans and objects. The concept of Ambient Intelligence (AmI) emerged in the 1990s as a technological paradigm and still operates as a vision of a sophisticated world to come: highlyperformative computer systems shall disappear into the background of the everyday and become undistinguishable from their surroundings.1 Sensors, chips and Internet software are to be integrated into daily things; traditional machines give way to so called smart objects, characterized as small and interconnected, automated, pro-active and predictive technologies. 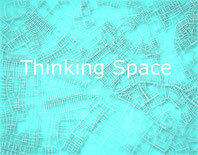 The Thinking Space has started in October 2012 with the aim to strengthen the social sciences’ and humanities’ contribution to the Ambient Intelligence research area. Since then, the team has developed methodologies to approach and analyse the implications of this phenomenon from three different angles: The quantum physicist Tanja Traxler has worked on the fundamental concepts of space and relation in physics, challenging them especially with philosophical ideas of relationality. By an analysis of techno-utopian literature the literary theorist Julia Grillmayr has explored the radical change in the way in which humans address the world implied by the Ambient Intelligence paradigm. The socio-economist Louise Beltzung Horvath has worked on how space concepts may add up to a postphenomenological analysis of disappearing technologies’ social impact. The following report presents the common results of Thinking Space as well as the interdisciplinary set-up and the time line of the project, including the dissemination efforts.